So Mortdecai had a predictably god-awful opening weekend. We could have seen that coming, as the marketing campaign seemed to be predicated entirely on people wanting to see a Johnny Depp movie. Is there any evidence that people do in fact want that? Or to put it another way: In the wake of Johnny Depp’s two other recent failed attempts at carrying a film, (2013’s The Lone Ranger and 2014’s Transcendence), is it time to ask if Depp is done as a movie star? The Hollywood Reporter basically asked the same question last week: “Will it be three strikes and you’re out of the A-list for Johnny Depp?” It seems, however, unlikely that the studios will give up on him. It takes a lot for Hollywood to let go of its male stars (actresses get far less wiggle room), especially when their crappy franchise films are cleaning up overseas. Depp has already signed on to make a sequel to his colossal hit Alice in Wonderland and yet another Pirates of the Caribbean movie, and both will turn massive global profits. But the failure of Mortdecai and his other recent flops belies an oft-misunderstood reality about Depp’s career. He is not a movie star, and he never has been. The major studios may have found him useful in a few franchises, and the huge grosses convinced studio execs that he could carry a film that came with no pre-awareness. They were wrong. He has never done it, and he never will. In his early years – when he was at his best – Depp channeled his oddball charisma into lonely, compelling outsiders like Edward Scissorhands, Ed Wood, and Sam from Benny and Joon, but his early attempts to carry a mainstream movie on his shoulders were abject failures. In the late 1990s, he made Nick of Time and The Astronaut’s Wife, B-movie thrillers that failed to find an audience or connect with critics. Brian Lowry of Variety noted that the appearance of “Depp in a rare conventional leading-man role may be a minor draw, but box office prospects appear limited.” He was right; the film was a flop, and The Astronaut’s Wife fared even worse, grossing only $10 million against its $75 million budget. After those failures, Depp understandably went back to his schtick, playing obsessed weirdos like Sleepy Hollow’s Ichabod Crane and the opium-smoking Victorian detective in the Hughes Brothers’ From Hell. It is equally understandable why he couldn’t say no to the role of Jack Sparrow in Pirates of the Caribbean. The Disney money was surely a factor (how else do you get your own island? ), but he also had a creative imperative: His Jack Sparrow was a hilarious, unique take on an archetype that has been largely absent from film for decades. Once he got a taste of movie stardom, Depp immersed himself in franchises, or at least potential ones. There were sequels to Pirates, and surely studio executives were hoping for potential sequels to Charlie and the Chocolate Factory and Dark Shadows; the former could still earn one. He also has made several attempts to break free from the shackles of kiddie franchises over the last few years, and all have failed. There was Public Enemies, which has had a bit of a critical re-evaluation these last few years but still bombed with audiences; The Tourist, a hugely ill-conceived attempt at playing an “everyman”; and then the three successive flops of the last three years. Looking at the last few years, it seems that Depp is trying to be both a movie star and an actor at the same time, and neither the industry nor the audience knows how to handle that. Meanwhile, Pirates and Alice keep on going, although it’s unclear how much credit Depp really deserves for their continued successes. He certainly played a major role in building those franchises with his witty, oddball performances, but they could probably now exist without his presence. Just like you can always plug another actor into the Batsuit, the Pirates and Alice movies are now strong enough to do well without any star power. Where does this leave Depp? Financially successful and creatively bankrupt, but there is still a larger lesson to be learned. Perhaps we can see in Depp’s long, winding career the devolution of creativity in the movie industry itself. The Hollywood machine took an eccentric and unique screen presence – who had a fatal flaw, as it turns out: his ridiculously good looks – and turned him into another spare part. 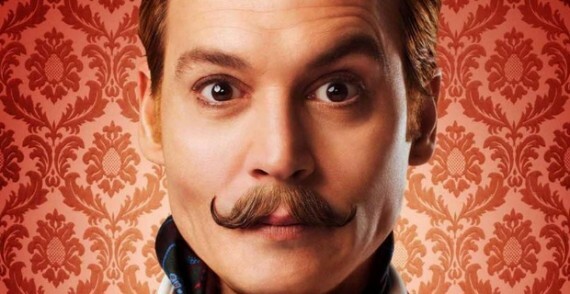 Did Johnny Depp Just Rip off Wes Anderson? Johnny Depp is my favorite actor and has been for a long time. Shame on you!